Faced with common global economic, social and environmental challenges, the international community is defining a set of Sustainable Development Goals (SDGs). The SDGs, which are being formulated by the United Nations together with the widest possible range of stakeholders, are intended to galvanize action worldwide through concrete targets for the 2015–2030 period for poverty reduction, food security, human health and education, climate change mitigation, and a range of other objectives across the economic, social and environmental pillars. Private sector contributions can take two main forms; good governance in business practices and investment in sustainable development. This includes the private sector’s commitment to sustainable development; transparency and accountability in honouring sustainable development practices; responsibility to avoid harm, even if it is not prohibited; and partnership with government on maximizing co-benefits of investment. The SDGs will have very significant resource implications across the developed and developing world. Estimates for total investment needs in developing countries alone range from $3.3 trillion to $4.5 trillion per year, for basic infrastructure (roads, rail and ports; power stations; water and sanitation), food security (agriculture and rural development), climate change mitigation and adaptation, health and education. Reaching the SDGs will require a step-change in both public and private investment. Public sector funding capabilities alone may be insufficient to meet demands across all SDG-related sectors. 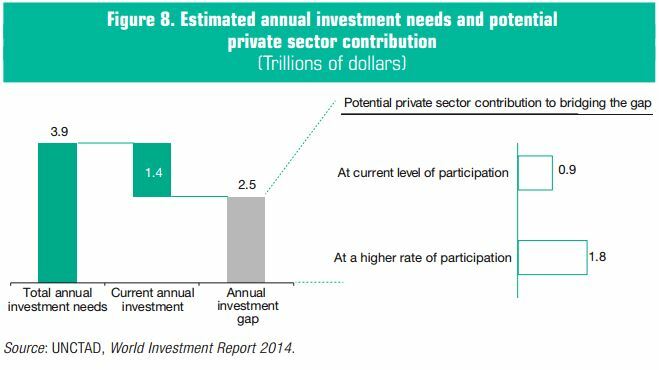 However, today, the participation of the private sector in investment in these sectors is relatively low. Only a fraction of the worldwide invested assets of banks, pension funds, insurers, foundations and endowments, as well as transnational corporations, is in SDG sectors, and even less in developing countries, particularly the poorest ones (LDCs). At today’s level of investment – public and private – in SDG-related sectors in developing countries, an annual funding shortfall of some $2.5 trillion remains (figure 8). Bridging such a gap is a daunting task, but it is achievable. Part of the gap could be covered by the private sector (in a “business as usual scenario”) if the current growth rate of private investment continues. For developing countries as a group, including fastgrowing emerging economies, the current growth of private investment could be sufficient, approximately, to cover the part of total SDG-related investment needs corresponding to the private sector’s current participation in SDG investments. However, at the aggregate level that would still leave a gap of about $1.6 trillion per year, and the relative size of this gap would be far more important in least developing countries and vulnerable economies. Increasing the participation of the private sector in SDG financing in developing countries could potentially cover a larger part of the gap. At a disaggregated level, the relative size of investment gaps will vary by SDG sector – private sector participation in some sectors is low and likely to remain so – and for different groups of developing countries. The starting levels and growth rates of private investment in SDG sectors in less developed countries are such that the private sector will not even cover the part of investment needs to 2030 that corresponds to its current level of participation. Investment and private sector engagement across SDG sectors are highly variable across developing countries. Emerging markets face entirely different conditions to vulnerable economies such as LDCs, LLDCs and SIDS. In LDCs, official development assistance (ODA) – currently their largest external source of finance and often used for direct budget support and public spending – will remain of fundamental importance. At the current rate of private sector participation in investment in SDG sectors, and at current growth rates, a “business as usual” scenario in LDCs will leave a shortfall that would imply a nine-fold increase in public sector funding requirements to 2030. This scenario, with the limited funding capabilities of LDC governments and the fact that much of ODA in LDCs is already used to support current (not investment) spending by LDC governments, is not a viable option. Without higher levels of private sector investment, the financing requirements associated with the prospective SDGs in LDCs may be unrealistic. A target for the promotion of private sector investment in SDGs in LDCs could be to double the current growth rate of such investment. The resulting contribution would give private investment a meaningful complementary financing role next to public investment and ODA. Public investment and ODA would continue to be fundamental, as covering the remaining funding requirements would still imply trebling their current levels to 2030. 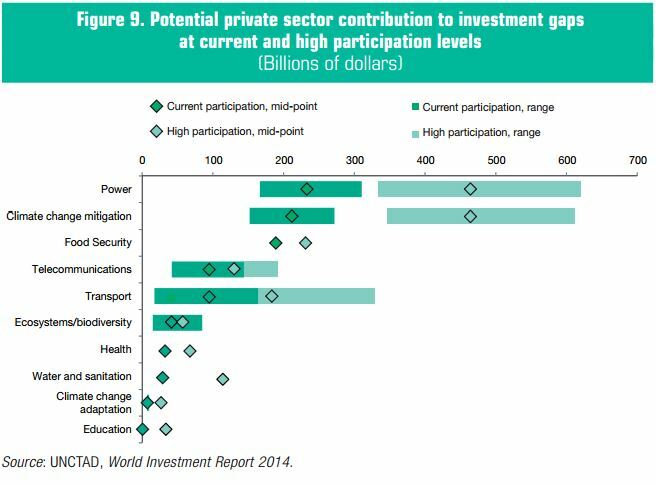 The potential for increasing private sector participation is greater in some sectors than in others (figure 9). Infrastructure sectors, such as power and renewable energy (under climate change mitigation), transport and water and sanitation, are natural candidates for greater private sector participation, under the right conditions and with appropriate safeguards. Other SDG sectors are less likely to generate significantly higher amounts of private sector interest, either because it is difficult to design risk-return models attractive to private investors (e.g. climate change adaptation), or because they are at the core of public service responsibilities and highly sensitive to private sector involvement (e.g. education and health care). Therefore, public investment remains fundamental and pivotal. However, because it is unrealistic to expect the public sector to meet all funding demands in many developing countries, the SDGs have to be accompanied by strategic initiatives to increase private sector participation. A first dilemma relates to the risks involved in increased private sector participation in sensitive sectors. Private sector service provision in health care and education in developing countries, for instance, can have negative effects on standards unless strong governance and oversight is in place, which in turn requires capable institutions and technical competencies. Private sector involvement in essential infrastructure industries, such as power or telecommunications can be sensitive in developing countries where this implies the transfer of public sector assets to the private sector. Private sector operations in infrastructure such as water and sanitation are particularly sensitive because of the basic-needs nature of these sectors. A second dilemma stems from the need to maintain quality services affordable and accessible to all. The fundamental hurdle for increased private sector contributions to investment in SDG sectors is the inadequate risk-return profile of many such investments. Many mechanisms exist to share risks or otherwise improve the risk-return profile for private sector investors. Increasing returns, however, must not lead to the services provided by private investors ultimately becoming inaccessible or unaffordable for the poorest in society. Allowing energy or water suppliers to cover only economically attractive urban areas while ignoring rural needs, or to raise prices of essential services, is not a sustainable outcome. A third dilemma results from the respective roles of public and private investment. Despite the fact that public sector funding shortfalls in SDG sectors make it desirable that private sector investment increase to achieve the prospective SDGs, public sector investment remains fundamental and pivotal. Governments – through policy and rule making – need to be ultimately accountable with respect to provision of vital public services and overall sustainable development strategy. A fourth dilemma is the apparent conflict between the particularly acute funding needs in structurally weak economies, especially LDCs, necessitating a significant increase in private sector investment, and the fact that especially these countries face the greatest difficulty in attracting such investment. Without targeted policy intervention and support measures there is a real risk that investors will continue to see operating conditions and risks in LDCs as prohibitive. Providing Leadership to define guiding principles and targets, to ensure policy coherence, and to galvanize action. Mobilizing funds for sustainable development – raising resources in financial markets or through financial intermediaries that can be invested in sustainable development. Channelling funds to sustainable development projects – ensuring that available funds make their way to concrete sustainable-development-oriented investment projects on the ground in developing countries, and especially LDCs. Maximizing impact and mitigating drawbacks – creating an enabling environment and putting in place appropriate safeguards that need to accompany increased private sector engagement in often sensitive sectors. The many stakeholders involved in stimulating private investment in SDGs will have varying perspectives on how to resolve the policy dilemmas inherent in seeking greater private sector participation in SDG sectors. A common set of principles for investment in SDGs can help establish a collective sense of direction and purpose. The following broad principles could provide a framework. Balancing liberalization and the right to regulate. Greater private sector involvement in SDG sectors may be necessary where public sector resources are insufficient (although selective, gradual or sequenced approaches are possible); at the same time, such increased involvement must be accompanied by appropriate regulations and government oversight. Balancing the need for attractive risk-return rates with the need for accessible and affordable services. This requires governments to proactively address market failures in both respects. It means placing clear obligations on investors and extracting firm commitments, while providing incentives to improve the risk-return profile of investment. And it implies making incentives or subsidies conditional on social inclusiveness. Balancing a push for private investment with the push for public investment. Public and private investment are complementary, not substitutes. Synergies and mutually supporting roles between public and private funds can be found both at the level of financial resources – e.g. raising private sector funds with public sector funds as seed capital – and at the policy level, where governments can seek to engage private investors to support economic or public service reform programmes. Nevertheless, it is important for policymakers not to translate a push for private investment into a policy bias against public investment. Balancing the global scope of the SDGs with the need to make a special effort in LDCs. While overall financing for development needs may be defined globally, with respect to private sector financing contributions special efforts will need to be made for LDCs, because without targeted policy intervention these countries will not be able to attract the required resources from private investors. Dedicated private sector investment targets for the poorest countries, leveraging ODA for additional private funds, and targeted technical assistance and capacity building to help attract private investment in LDCs are desirable. Leadership is needed not only to provide guiding principles to deal with policy dilemmas, but also to: Set investment targets. The rationale behind the SDGs, and the experience with the Millennium Development Goals, is that targets help provide direction and purpose. Ambitious investment targets are implied by the prospective SDGs. The international community would do well to make targets explicit, and spell out the consequences for investment policies and investment promotion at national and international levels. Achievable but ambitious targets, including for increasing public and private sector investment in LDCs, are desirable. Ensure policy coherence and creating synergies. Interaction between policies is important – between national and international investment policies, between investment and other sustainable-developmentrelated policies (e.g. tax, trade, competition, technology, and environmental, social and labour market policies), and between micro- and macroeconomic policies. Leadership is required to ensure that the global push for sustainable development and investment in SDGs has a voice in international macroeconomic policy coordination forums and global financial system reform processes, where decisions will have an fundamental bearing on the prospects for growth in SDG financing. Establish a global multi-stakeholder platform on investing in the SDGs. A global multi-stakeholder body on investing in the SDGs could provide a platform for discussion on overall investment goals and targets, fostering promising initiatives to mobilize finance and spreading good practices, supporting actions on the ground, and ensuring a common approach to impact measurement. Create a multi-agency technical assistance facility for investment in the SDGs. Many initiatives aimed at increasing private sector investment in SDG sectors are complex, requiring significant technical capabilities and strong institutions. A multi-agency institutional arrangement could help to support LDCs, advising on, for example, the set-up of SDG project development agencies that can plan, package and promote pipelines of bankable projects; design of SDG-oriented incentive schemes; and regulatory frameworks. Coordinated efforts to enhance synergies are imperative. Creating fertile soil for innovative SDG-financing approaches. Innovative financial instruments and funding mechanisms to raise resources for investment in SDGs deserve support to achieve scale. Promising initiatives include SDG-dedicated financial instruments and Impact Investment, funding mechanisms that use public sector resources to catalyse mobilization of private sector resources, and new “go-to-market” channels for SDG investment projects. Building or improving pricing mechanisms for externalities. Effective pricing mechanisms for social and environmental externalities – either by attaching a cost to such externalities (e.g. through carbon taxes) or through market-based schemes – are ultimately fundamental to put financial markets and investors on a sustainable footing. Promoting Sustainable Stock Exchanges (SSEs). SSEs provide listed entities with the incentives and tools to improve transparency on ESG performance, and allow investors to make informed decisions on responsible allocation of capital. Introducing financial market reforms. Realigning rewards in financial markets to favour investment in SDGs will require action, including reform of pay and performance structures, and innovative rating methodologies that reward long-term investment in SDG sectors. 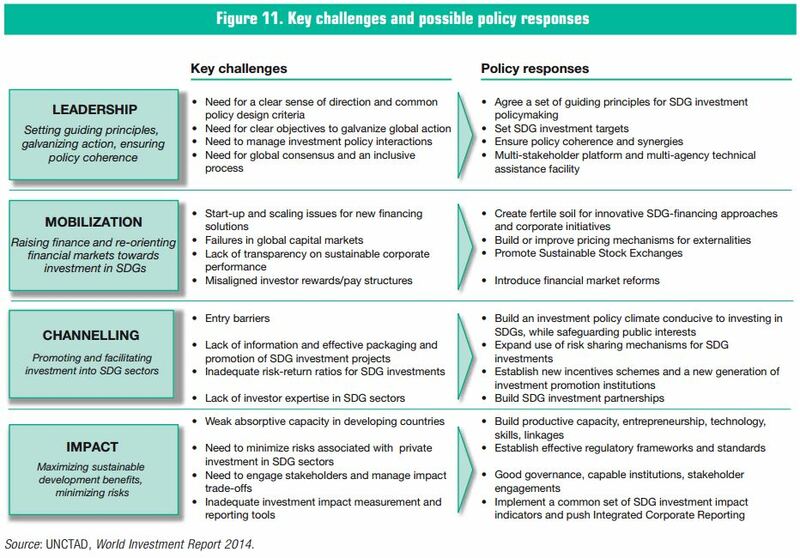 Key constraints to channelling funds into SDG sectors include entry barriers, inadequate risk-return ratios for SDG investments, a lack of information and effective packaging and promotion of projects, and a lack of investor expertise. Effective policy responses may include the following. Reducing entry barriers, with safeguards. A basic prerequisite for successful promotion of SDG investment is a sound overall policy climate, conducive to attracting investment while protecting public interests, especially in sensitive sectors. Expanding the use of risk-sharing tools for SDG investments. A number of tools, including public-private partnerships, investment insurance, blended financing and advance market commitments, can help improve the risk-return profile of SDG investment projects. Establishing new incentives schemes and a new generation of investment promotion institutions. SDG investment development agencies could target SDG sectors and develop and market pipelines of bankable projects. Investment incentives could be reoriented, to target investments in SDG sectors and made conditional on social and environmental performance. Regional initiatives can help spur private investment in cross-border infrastructure projects and regional clusters of firms in SDG sectors. Building SDG investment partnerships. Partnerships between home countries of investors, host countries, TNCs and multilateral development banks can help overcome knowledge gaps as well as generate joint investments in SDG sectors. Increasing absorptive capacity. A range of policy tools are available to increase absorptive capacity, including the promotion and facilitation of entrepreneurship, support to technology development, human resource and skills development, business development services and promotion of business linkages. Development of linkages and clusters in incubators or economic zones specifically aimed at stimulating businesses in SDG sectors may be particularly effective. Establishing effective regulatory frameworks and standards. Increased private sector engagement in often sensitive SDG sectors needs to be accompanied by effective regulation. Particular areas of attention include human health and safety, environmental and social protection, quality and inclusiveness of public services, taxation, and national and international policy coherence. Good governance, strong institutions, stakeholder engagement. Good governance and capable institutions are a key enabler for the attraction of private investment in general, and in SDG sectors in particular. They are also needed for effective stakeholder engagement and management of impact tradeoffs. 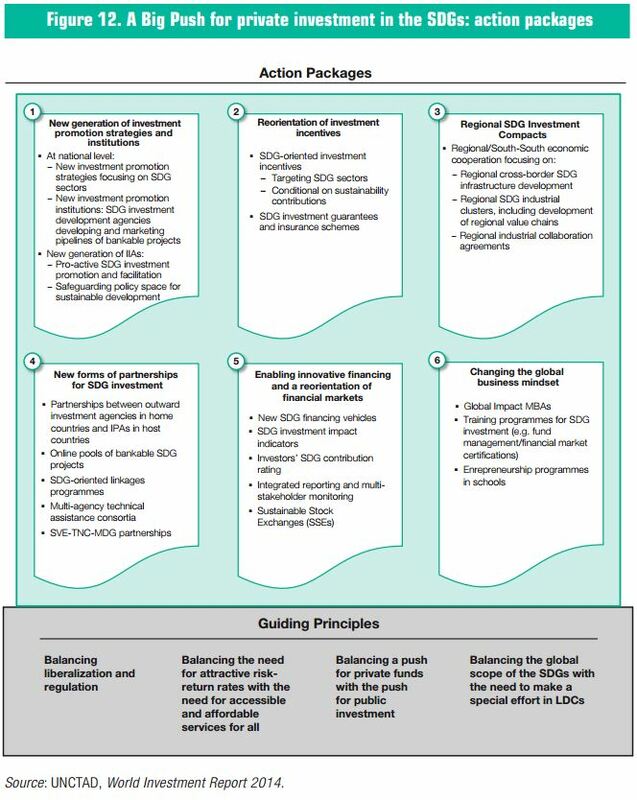 Implementing SDG impact assessment systems. Monitoring of the impact of investment, especially along social and environmental dimensions, is key to effective policy implementation. A set of core quantifiable impact indicators can help. Impact measurement and reporting by private investors on their social and environmental performance promotes corporate responsibility on the ground and supports mobilization and channelling of investment. Figure 11 summarizes schematically the key challenges and policy responses for each element of the Strategic Framework. 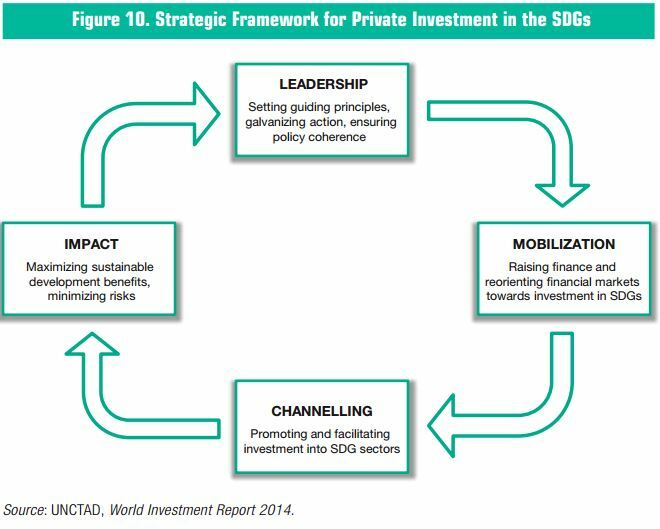 Detailed policy responses are included in UNCTAD’s Action Plan for Private Investment in the SDGs. A new generation of investment promotion strategies and institutions. Sustainable development projects, whether in infrastructure, social housing or renewable energy, require intensified efforts for investment promotion and facilitation. Such projects should become a priority of the work of IPAs and business development organizations. The most frequent constraint faced by potential investors in sustainable development projects is the lack of concrete proposals of sizeable, impactful, and bankable projects. Promotion and facilitation of investment in sustainable development should include the marketing of pre-packaged and structured projects with priority consideration and sponsorship at the highest political level. This requires specialist expertise and dedicated units, e.g. government-sponsored “brokers” of sustainable development investment projects. Putting in place such specialist expertise (ranging from project and structured finance expertise to engineering and project design skills) can be supported by technical assistance from a consortium of international organizations and multilateral development banks. Units could also be set up at the regional level to share costs and achieve economies of scale. Promotion of investment in SDG sectors should be supported by an international investment policy regime that effectively pursues the same objectives. Currently, IIAs focus on the protection of investment. Mainstreaming sustainable development in IIAs requires, among others, proactive promotion of investment, with commitments in areas such as technical assistance. Other measures include linking investment promotion institutions, facilitating SDG investments through investment insurance and guarantees, and regular impact monitoring. SDG-oriented investment incentives. Investment incentive schemes can be restructured specifically to facilitate sustainable development projects. A transformation is needed from purely “location-based” incentives, aiming to increase the competitiveness of a location and provided at the time of establishment, towards “SDG-based” incentives, aiming to promote investment in SDG sectors and conditional upon sustainable performance. Regional SDG Investment Compacts. Regional and South-South cooperation can foster SDG investment. Orienting regional cooperation towards the promotion of SDG investment can be especially effective for cross-border infrastructure development and regional clusters of firms operating in SDG sectors (e.g. green zones). This could include joint investment promotion mechanisms, joint programmes to build absorptive capacity, and joint public-private partnership models. New forms of partnership for SDG investments. Cooperation between outward investment agencies in home countries and IPAs in host countries could be institutionalized for the purpose of marketing SDG investment opportunities in home countries, provision of investment incentives and facilitation services for SDG projects, and joint monitoring and impact assessment. Outward investment agencies could evolve into genuine business development agencies for investments in SDG sectors in developing countries, raising awareness of investment opportunities, helping investors to bridge knowledge gaps, and practically facilitate the investment process. Concrete tools that might support SDG investment business development services might include online pipelines of bankable projects and opportunities for linkages programmes in developing countries. A multi-agency technical assistance consortium could help to support LDCs. South-South partnerships could also help spread good practices and lessons learned. Enabling innovative financing mechanisms and a reorientation of financial markets. New and existing financing mechanisms, such as green bonds or impact investing, deserve support and an enabling environment to allow them to be scaled up and marketed to the most promising sources of capital. Publicly sponsored seed funding mechanisms and facilitated access to financial markets for SDG projects are further mechanisms that merit attention. Furthermore, reorientation of financial markets towards sustainable development needs integrated reporting on the economic, social and environmental impact of private investors. This is a fundamental step towards responsible investment behavior in financial markets and a prerequisite for initiatives aimed at mobilizing funds for investment in SDGs; integrated reporting is at the heart of Sustainable Stock Exchanges. Changing the global business mindset and developing SDG investment expertise. The majority of managers in the world’s financial institutions and large multinational enterprises – the main sources of global investment – as well as most successful entrepreneurs tend to be strongly influenced by models of business, management and investment that are commonly taught in business schools. Such models tend to focus on business and investment opportunities in mature or emerging markets, with the risk-return profiles associated with those markets, while they tend to ignore opportunities outside the parameters of these models. Conventional models also tend to be driven exclusively by calculations of economic risks and returns, often ignoring broader social and environmental impacts, both positive and negative. Moreover, a lack of consideration in standard business school teachings of the challenges associated with operating in poor countries, and the resulting need for innovative problem solving, tend to leave managers ill-prepared for pro-poor investments. A curriculum for business schools that generates awareness of investment opportunities in poor countries and that instills in students the problem solving skills needed in developing-country operating environments can have an important longterm impact. Inserting relevant modules in existing training and certification programmes for financial market participants can also help. The Action Plan for Private Investment in the SDGs is meant to serve as a point of reference for policymakers at national and international levels in their discussions on ways and means to implement the SDGs and the formulation of operational strategies for investing in the SDGs. It has been designed as a “living document” and incorporates an online version that aims to establish an interactive, open dialogue, inviting the international community to exchange views, suggestions and experiences. It thus constitutes a basis for further stakeholder engagement. UNCTAD aims to provide the platform for such engagement through its biennial World Investment Forum, and online through the Investment Policy Hub.